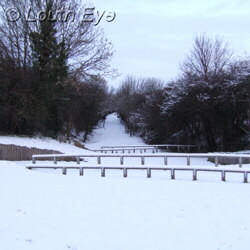 The cold snap has caused travel disruption and school closures in Louth, but it also looks kinda pretty, when viewed from the right angle. Which is to say, from indoors. 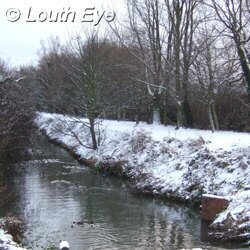 These were scenes from the Railway Walk, the Louth Canal near Riverhead lock, and approaching the Gatherums from Queen Street car park. 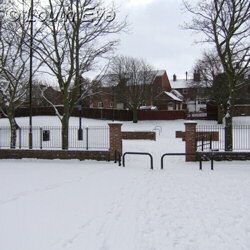 Earlier this winter, in mid-December 2009, the railings at the steep junction between Cinder Lane and Kidgate bore the evidence of a crash due to ice. 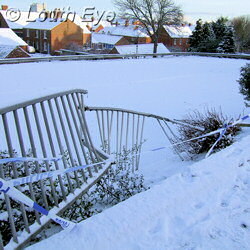 This was just one of a number of road accidents caused by adverse driving conditions in the area. 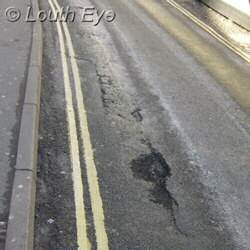 The freezing conditions have also taken their toll on road surfaces, causing potholes such as this one in Burnt Hill Lane on the 4th of January, pictured left.